I have a great talent for getting lost. This is generally not a good thing, but if you’ve just moved into a new area, I highly recommend you to get lost every once in a while since this almost always leads to finding new places you never knew existed. During one of my short-dog-walks-turning-into-a-longer-dog-walk, I stumbled upon a wonderful little shop called Kabelverket. In a small concrete room, big industrial vintage lamps covered the ceiling, along with old maps and rusty metal signs stacked on shelves and the walls. I fell in love. 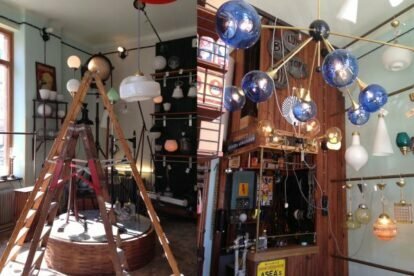 The store is run by two brothers, who travel all over Sweden, collecting vintage industrial lamps, decorations and other salvageable goods with which they create great interior pieces. In the beginning of this year, Kabelverket switched addresses, re-named the boutique Svenska Armaturer and opened their new showroom in a former tobacco shop; now focusing on designing, restoring and selling one-of-a-kind lamps. You can swing by their instagram account for a quick preview of the different types of lamps they sell. At Svenska Armaturer you can find warm retro pieces from the 1950s, as well as wonderful Italian brass fittings decorated with porcelain and opal glass. This great little shop is located next door from Dunke design, so I truly recommend you stop by both of venues and update your home with some show-stopper interior design.